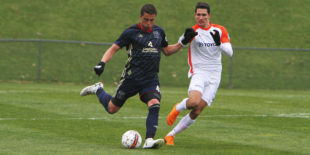 Bethlehem Steel FC and FC Cincinnati tied 1-1 in a back-and-forth contest on Sunday afternoon at Goodman Stadium, with a late goal by the visitors’ Naz Albawadi canceling out Cory Burke’s first-half finish. The first half in particular was intense, exciting, enjoyable soccer, with the pace letting up once the rain came and both sides began to tire. FC Cincinnati is clearly a better team than last year’s edition. They have greater team speed and use it defensively to pressure in the midfield, even with three players getting their first starts of the season. They play a higher defensive restraining line as well, because they can safely recover into the green space behind it. For the first 15 minutes of the first half the Orange and Blue had the Steel thoroughly on the back foot. Cincy was jumping the passing lanes and playing much faster than the Steel’s minds expected. Passes familiar to those who have watched Bethlehem this year were intercepted repeatedly, and the eye test said the Steel were in trouble. The opening goal in the 15th minute — an Anthony Fontana shot from inside the box that deflected smartly off Burke into the net — was definitely against the run of play. But the goal turned the game’s balance, as Bethlehem held most of the play in the second part of the first half. In a change that had to please both the player development teacher (coach Burke) and the reserves conditioner (coach Curtin), the Bethlehem squad picked up their pace both physically and mentally and began to control their opponents. Derrick Jones at defensive center midfield began to anticipate the Ohioans’ attacks, destroy them, and find midfielders in front of him to start the counterattack. Josh Yaro shook off early layers of rust and remembered how to pass incisively into the midfield gaps, in addition to applying his strength and speed against a dangerous opposing striker. Santi Moar is a better creative force than Fabian Herbers or Marcus Epps. He defeats his mark on the dribble repeatedly and reliably and shoots when he has the chance. His horizontal penetration and play as a facilitator when in the center of the field are productive and essential. And while it was worrisome that Brenden Aaronson had to be taken for evaluation at a local hospital after a clean but brutal shoulder charge from Cincinnati’s Forrest Lasso, Anthony Fontana moving to attacking center mid in front of Aaronson’s replacement Mike Catalano corresponded to Bethlehem’s improvement. His movement was more precise, while Aaronson’s had usually been a yard off being in the right place. As was no surprise to observers familiar with the recent spate of organization injuries among defensive players, Josh Yaro was replaced at half-time in his first injury rehab game. His absence changed the dynamic of the contest one more time. Matt Mahoney is a competent USL emergency center back, but he is not an MLS level one. And Eric Ayuk anticipates less well defensively at right back than does Mahoney, but he provides an offensive threat with speed and “combinability” that the former Temple man does not. Ayuk forced Cincinnati head coach Alan Koch to replace starting left back Matt Bahner with midfield speed merchant Lance Laing in the 62nd minute. 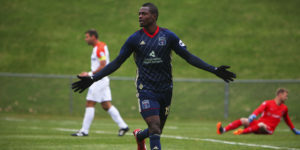 But in the 72nd minute Cincy striker Emery Welshman found attacking center mid Naz Albadawi inside the box for the former North Carolina FC mainstay’s first USL goal in his first USL start. And the match was tied. It remained tied about nine minutes later thanks to goalkeeper and captain John McCarthy. 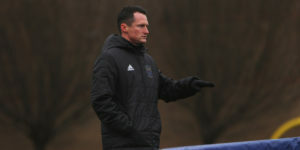 When Brandon Aubrey slipped down trying to receive a back pass from a teammate in central midfield, McCarthy stoned cold the Cincinnati player’s shot. Were coach Burke more given to dramatics, he would call this game’s point the McCarthy point, as the Rhinelanders had no business not scoring on the play. Two goals in two games: Cory Burke remains Bethlehem’s career goals scored leader with 15, finding his second in as many games. He played the entire ninety minutes, which we suspect is the point of his playing down with the Steel recently after an auspicious beginning as a substitute with the Union. Greater game conditioning may mean a greater role with the first team. Improvement: Last time the Steel played a team of this quality was the second game of the season in St, Petersburg FL against the Rowdies. In that game after a successful first 15 minutes, Bethlehem were outclassed. They were not outclassed today, Cincinnati knows they are fortunate to earn a point in the Lehigh Valley, as head coach Alan Koch acknowledged afterwards. The original Mr. Steel (21st century version): Derrick Jones has played the number six, defensive central midfielder, in the absence of James Chambers. He had a good deal to do with Cincinnati’s failure to do more than fight back for a tie in the match. He is not the captain as an offensive distributor. Nobody in the organization but Haris Medujanin is that. But he read where he needed to be, got there, and executed, defending his defense well in the second half especially. Cincinnati: Evan Newtown; Justin Hoyte, Dekel Keinan ©, Forrest Lasso, Matt Bahner (Lance Laing 62’); Richie Ryan; Emmanuel Ledesma, Nawzi Albadawi, Daniel Haber (Jimmy McGlaughlin 79’), Corben Bone,; Emery Welshman (Danni Konig 76’). Unused Substitutes: Spenser Richey; Sem de Wit, Blake Smith, Will Seymore. It was a good match, would have liked to see more of Aaronson, hopefully it’s not too serious. Side note about ESPN+. Video was much better, the framerate was very good for live streaming video. It did glitch out a half dozen times, but never for more than a second. I was told the commentary was from the league staff as they sounded unfamiliar but were less biased and had far far greater knowledge of the roster then the usual away commentary. Would have preferred Burke and Fontana getting starts in Chester Friday night. Sapong and Dockal both need a reset.